Leading NHS clinicians and universities will benefit from new world class facilities and support services built by the 5-year funding package totalling £816 million – the largest ever investment into health research. Mental health research will see funding increase to nearly £70 million, dementia to over £45 million, deafness and hearing problems will receive over £15 million and antimicrobial resistance research rises to around £45 million. The UK has so often led the world in health research – from the invention of the smallpox vaccine to the discovery of penicillin and the development of DNA sequencing. Today, we are making sure the UK stays ahead of the game by laying the foundations for a new age of personalised medicine. 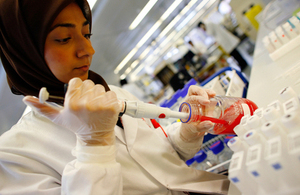 We are supporting the great minds of the NHS to push the frontiers of medical science so that patients in this country continue to benefit from the very latest treatments and the highest standards of care. The funding has been awarded to 20 NHS and university partnerships across England through the National Institute for Health Research (NIHR). Each of the 20 biomedical research centres will host the development of new, ground-breaking treatments, diagnostics, prevention and care for patients in a wide range of diseases like cancer and dementia. The future of NHS care depends on the science we do now. This new funding will enable clinical researchers to keep pushing for medical breakthroughs. The NIHR biomedical research centres announced today offer huge potential benefits for patients across the country. The table shows the successful applicants who will receive a share of the £816 million investment. Each local partnership between the NHS and university will be known as an NIHR biomedical research centre. The UK is already a world leader in pioneering medical breakthroughs and this record investment will ensure this strong tradition continues. It is estimated that for every £1 the Department of Health invests, hospitals/universities will generate £6 from public funders of research, charities and industry partners.